Look at the all the beautiful veggies I bought from our local farmer's market. I have plans to make a root vegetable soup (will post recipe later), squash casserole, and roasted turnips. I love summer! The scale is moving again after a 2 week stall. One of those weeks was during our trip to Atlantic City. We had a fantastic time. I ate whatever a wanted (in much smaller portions) and never gained an ounce! We also walked the boardwalk every day, some days we did it twice just because the weather was so dang nice. The 170's are so close and I'm very impatient to get there. NSV: My closet is getting very bare as I purge the clothing that no longer fits. Sometimes I find items that were too small and have them fit perfectly! It's great to shop within my own closet :) I am putting off going real shopping for as long as possible, I hate thinking of buying things that will no longer fit me in a month or two. Fitness: I track my workouts in MFP and it has been helping to keep me dedicated. I have been alternating morning walks between 4 and 2 miles. The pool has warmed enough to begin swimming laps, I started doing 20 minutes of laps yesterday and it feels wonderful! I still need to find the time to add some strength training. Nutrition: I am still tracking my food intake and usually get 70-80g of protein. I have become comfortable in my low carb lifestyle. Seafood is always a staple in our family and I have started experimenting with new vegetable recipes. I usually eat veggie omelet mid-morning, at least one fruit a day for snack and supper is a protein and a vegetable. I also add a protein shake when its necessary to meet my protein goal, I love the chocolate ones. Hydration: I am still tracking my water intake and have to keep focused on it. I find if I don't track, I fall short. I only count pure water, any other liquids like milk or protein shakes I count with my food. I think now that the heat of summer is upon us, drinking more water will come more naturally. My Upcoming Week: I have several challenges this week. Of course the biggie....Mother's Day! I will be doing a Mother's Day buffet of all things. (eye roll) I keep telling everyone its a waste of money to pay for something like this since I cannot eat much. I am reminded it is also a social affair so I will concentrate on talking and enjoying the day and eat only my small portion. Saturday we will be attending a seafood boil, not so bad as long as I concentrate on eating the seafood and not the alcohol. The rest of the week looks normal with nothing to derail my healthy lifestyle efforts. Well done another loss. Those veggies look good. 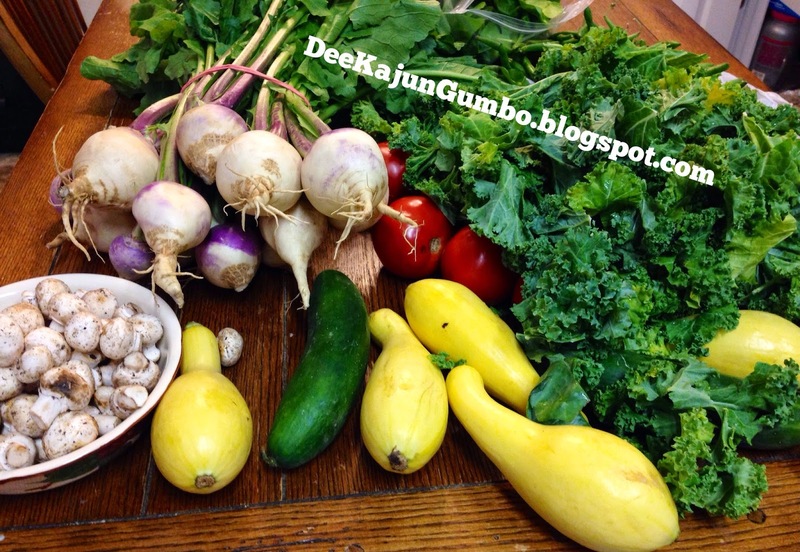 I love fresh veggies! I can't wait to start hitting the farmers markets in our area in the coming weeks. Also, I'm craving strawberry season so bad!